In this post i’ll show you how to add a webslice to a webcontrol in Access 2010. I got the idea watching the video from Albert Kallal. He created a webdatabase called “Room Bookers”. 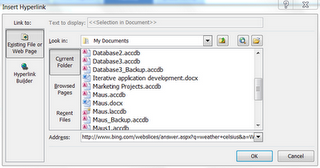 In this database Albert used various techniques to try out the new web database technology added in the Access 2010 version. 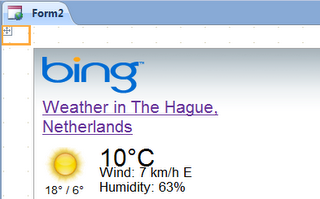 Now one of the features I liked was the fact that he imlpemented a webcontrol showing the weather in a certain place. That’s what I wanted to try. The webcontrol is a control you can add to your form in Access. You can use it (among other things) to show internetpages or webslicers. Webslicers are designated pieces which are a part of a website. In the weather part I just wanted a piece of the website to use in my Access form. So here we go. First create an empty db with one form. On this form add a webcontrol which you can find in the ribbon under controls. After you click the webcontrol on the form you’ll be prompted to enter the hyperlink or webaddress. 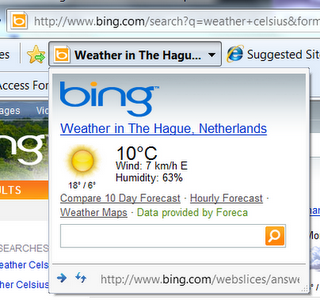 In this case I added the webaddress from Bing. The webcontrol got filled with the complete website and that’s not what I wanted. I just wanted the little piece showing me the weather. So how did Albert do this? He used a webslice instead of a whole website. Ok so it’s of to create a webslice. the most interesting because it has a special feature. Now for ease of use I added it to the favorites bar so I can check if it’s really there. and it is! Now all I have to do is copy the url from this webslice and paste in into my own webcontrol used in the database. As you can see I added the webslice address to the address of the [Insert Hyperlink] dialog and clicked OK. Now let’s see if this worked on my form. This entry was posted in Access, Office Tips and Tricks and tagged Access, bing, Form, webcontrol, webslice on July 25, 2011 by Maurice.